Twitter just redesigned their homepage to put more of a focus on dynamic content, with the aim of showing new users that it’s not as frivolous as they might think. 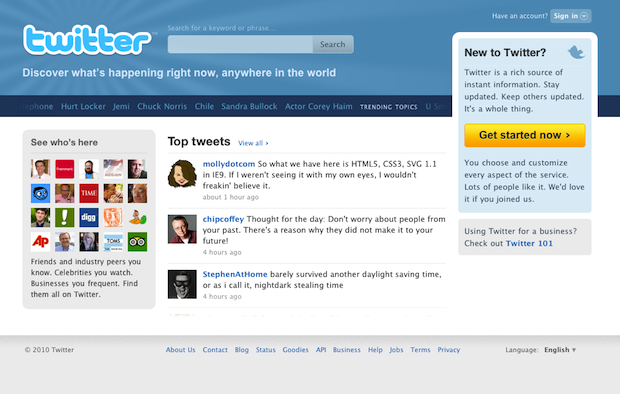 Twitter‘s new homepage, aside from being simply more aesthetically pleasing than the old one, does a much better job of showing new users what the service is actually about. The first thing you’ll notice upon visiting the new page is that Twitter has put its most popular topics, tweets, and users front and center. Right in the middle is now a “Top Tweets” section that dynamically updates. Twitter uses a custom algorithm to decide what these are, often due to popularity or general interest. On the left is now a sampling of high-profile users, from celebrities to publications to news outlets to just normal people. Hovering over those icons gives more information about that user, including their latest tweet. Best of all, the trending topics are no longer a static clump of text, but a dynamically scrolling list. Hovering over that list will tell you exactly why Justin Bieber is popular (though only in the “number of tweets” sense, not in the more esoteric “why in God’s name is Justin Bieber a trending topic?” sense). much being shared, we know that there’s something of value for everyone.